The Bentley School of Accounting and Finance, founded in 1917, has come a long way from its establishment in Boston's Back Bay neighborhood as a male-only accounting and finance college. Despite Bentley's tremendous progress and expansion, one thing has remained constant since 1924: The Alpha Gamma Pi Fraternity. The only Greek Life organization founded in Bentley's first decade that is still in operation on campus today, AGP, is a tight-knit and diverse brotherhood that prides itself on academic achievement, philanthropic participation and brotherly support. In 1924, a group of seven young men decided to take their desire to create a thriving brotherhood and make it a reality. They came together to form Bentley’s first social fraternity. 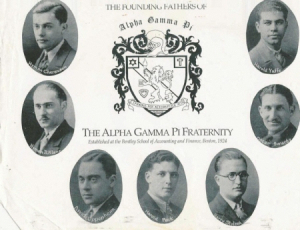 Alpha Gamma Pi was founded on a set of core values that the Founding Fathers believed would shape every member into a positive influence on their community both during their college years and afterwards. A very important aspect of our organization’s history is the fact that we are a local fraternity. We have no national office to report to so we have complete control over all aspects of our fraternity, from ritual to day-to-day operations. Because of this free reign, the fraternity takes immense pride in our close knit brotherhood which has ensured the fraternity’s survival for over 90 years. The organization has undergone many changes over its lifetime but has always maintained the core values that our seven Founding Fathers deemed essential to the life of our fraternal organization. Proud of our local heritage, Alpha Gamma Pi has always focused on fostering our ideals among the Bentley community.